Will the Unichip void my vehicle’s warranty? Long answer – There are two parts to this question. First, will your vehicle’s OEM void your warranty if they find the Unichip on your vehicle? Second, will you vehicle’s OEM find the Unichip on your vehicle/ Legally, no manufacturer can void a warranty because of the use of aftermarket parts or service so “legally” even if the OEM finds the Unichip, they can’t void the warranty; you may find yourself suing the OEM to make the point however. That makes the second question the more important in the real world. 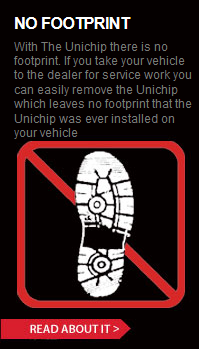 The Unichip makes no physical or electronic change to any of your vehicle’s systems so there are no “footprints” remaining for the OEM to use to raise any questions. Technical answer – Under US Federal Law, specifically the Moss-Magnusson Act of 1975, no manufacturer of any consumer product including automobiles may void their warranty because a customer uses non-OEM parts or service unless they can prove to the US FTC that those parts or that service caused the warranty problem. Legally, just because your vehicle’s OEM might find the Unichip on your vehicle they may not void your warranty. Obviously, that doesn’t mean OEM’s can’t and don’t tell customers that their warranty is voided when they find modifications. The practical issue, then, is will the OEM know you have installed the Unichip. Most aftermarket engine management system change engine performance by changing the data in the OEM ECU so that it responds differently. Every time the OEM ECU is reprogrammed, it records the event which means every time you use a reflash downloader, the OEM ECU records a footprint that you have been playing around. Whenever you take your vehicle in for service, the first thing the dealer does is download the ECU’s data and when they do, they see all of the footprints. Most downloaders give you the ability to reprogram the ECU back to stock, but the footprint isn’t the data so reprogramming the ECU doesn’t help… in fact, now the ECU reports two reprogrammings not one. The Unichip, on the other hand, leaves no electronic, electrical, or physical trace, or footprint it has been installed once removed. In fact, there is no electrical or electronic footprint even when the Unichip is installed and operating although obviously it’s there to be seen if you leave it installed when your go to the dealer. There are two schools of thought among car dealers… those who encourage – and even help – their customers to play with their vehicles and those who don’t. Which school your dealer subscribes to is obviously something only you can determine. We actually sell a lot of kits to dealers who install the parts for their customers. If you have a dealer that supports and encourages modifications, you can leave the Unichip installed when you take your car in for service and it won’t interfere with or change anything while they do their work. They can reprogram the OEM ECU, scan and download the OEM ECU, and do anything else they want and will never see any changes because of the Unichip. They also can’t inadvertently erase or change the data within the Unichip because unique hardware and software is required to program the Unichip. If your dealer doesn’t support modifications, or if you’re unsure and unwilling to take a chance, you can remove the Unichip in just a few minutes before you take your vehicle in. Once the system has been removed, there are no footprints of any kind remaining to raise any questions. Regardless of what tools the dealers may be using, it’s impossible for them to see the Unichip was ever installed.